Stay tuned for upcoming events for EDM Festival in near future. 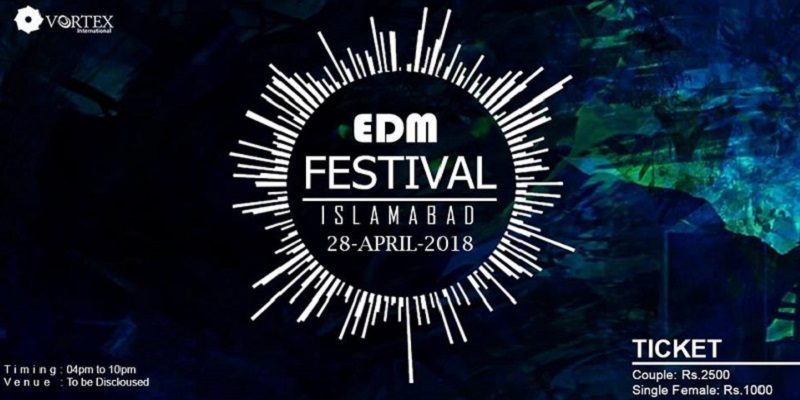 EDM Festival will take place on 28th April 2018 in Islamabad, Pakistan. This event is being organized by Vortex International. World renowned DJs will perform at Pakistan's first Electronic Dhamaal Music Festival. Music fans get ready for first edition of EDM Festival. - No entry without original CNIC/valid student card/ alumni card. - No weapons, drugs allowed on the premises (strict action will be taken). - Anyone caught misbehaving/involved in fighting will be directly answerable to Security Department. Best Viewed at 1024 x 768 pixels and above. This Page loaded in 0.0242 seconds on Tue, Apr 23, 2019 (20:57).